December 22, 2015: Seaching for some seasonal spirit. I like the tree, but who/what is KeepTru? Hi Sean, Robert and redkayak! Welcome to this Christmassy-thingy. Robert, KeepTru is a combination of my husband's any my last names (Keepnews, Trudel). Kind of perfect, I must say! Glad you're now free to listen, redkayak! Sean, those ornaments are a mainstay for us. Not pictured, our Santa on a Mets rocking horse. Irene, really wanted to stay with you until 5 am but starting to fade a bit so will catch the rest of the show on archive. Have a cracking Yuletide. Do the cats climb into & up the KeepTru tree & stalk the ornaments, as I've seen elsewhere? I've known housebroken dogs to make a sissy on a Xmas tree, like, "I must be outside, it's a tree." They think of the ornaments as fruit too. Totally understood. Pleasant dreams, Sean! Robert, surprisingly they don't anymore. I used to tack the tree to the window with fishing line. My kitties are getting a bit older (and one of them is doing quite poorly at the moment). They haven't even ventured underneath it yet. But they do love the smell. Catnip-filled ornaments would be either a great idea or a terrible idea. I'm not sure which yet. sorry to ave missed Laura Nyro, but i think it's high time i pull the album out anyway. Ken, I don't think that's a good idea. Best not to attract too much feline attention to the tree. 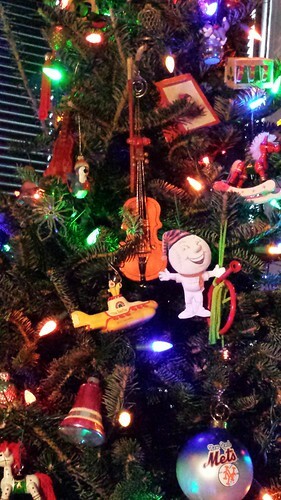 I've taken to hanging non-breakable ornaments near the bottom. Yes, coelacanth, Christmas and the Beads of Sweat has some gorgeous tunes. Bert b. 3rd Nov. like me. Just sayin'. Happy Holidays Irene. Thank you for this. Cool, Rev. Rabbit! Bert wasone of my favorite guitarists, as was John Renbourn. Any chance December will be magic again? Wow what a set list. I've missed out. Hi Van! I'm trying to whip up a little magic tonight. Hope it's helping. Greatest Xmas song of all time by her KaTeness, you know. Just saying. Today walking along the National Mall, an enormous hawk in a tree. An unsuspecting squirrel going up the trunk. Oops. The hawk took notice....so did Mr. Squirrel. It was quite a hilarious back and forth between them for a while. Squirrel won. hey Irene i'm turning the computer off but i'll still be listening. Irene are you here next week? Or taking New Years days off? How damn marvelous. I haven't heard this Strawbs track in decades. And yeah, not New Year's Day, but days before. Brining out the Kate Bush for Christmas! I needed this. So many thanks. Happy Christmas greetings for NorCal, Irene! Thank you so very much! I'm definitely here next week, Van. gonna do my annual best-of show. Awesome. Glad to hear it. Thanks again Irene. You are always just the bestest. So sweet, croonbat! And thank you, Summer and Michael. Parq, that Strawbs track is a fave too. They're playing the US in the spring. Yikes, Ken, that sounds positively painful! Holiday depression is real. Never before have I had it so bad. This show has helped, just in the 40 minutes I've been privileged to hear. Thank you Irene. Thanks Van! I'm not feeling very spirited this year. Playing this music definitely helps me, so I'm hoping it helps others as well. Hearing this piano is like looking at a master artwork...wow. I've never heard this Phil Ochs! Actually, thinking about blessings in my life... this show is definitely one of them. Truth. Well, hope you all have nice holidays! Catch younext week. Thanks, Irene. This show was just swell! This Joseph Spence is the greatest Christmas recording ever. wishing everyone the BEST and BRIGHTEST Holly-Daze, and again, THANK YOU IRENE! Just remembered that I missed the first couple hours of this show! Post Christmas treat for me to be able to catch up! I am so glad I came back for pars missed! Wow, what a show.